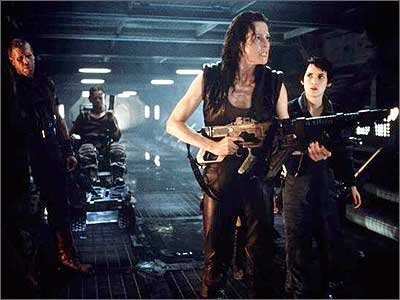 I will be the first to say that I am one of the few people that does not flat out hate Alien Resurrection. It is by far the weakest film in the Quadrilogy and it does say a lot that the only quote of praise they could muster is from People magazine. On paper, this film should have been amazing with Joss Whedon penning the screenwriter and Jean-Pierre Jeunet (Amelie and Delicatessen) helming the project as director. Sadly, this mental hype on my part is why the final project was such a disappointment. As was mentioned earlier, I do not dislike this film as much as I had before. A lot of the fault lays with the script and frankly, I do not buy Whedon's systematic criticism of the direction borne from it (This leads to some interesting reading, which is very entertaining). There are some interesting ideas that are presented in the film and they just never get fleshed out. Who is to blame for this issue, that is hard to say. As with the later two films, there is glaring interference from the studio and this unfortunately rubs off on the final product of both films. If Whedon is to believed, the final act of his initial draft of the film could have been amazing. This is a matter of conjecture though. 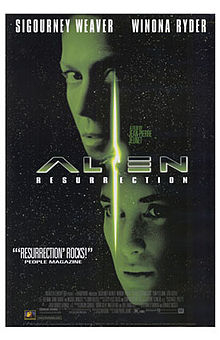 Alien Resurrection at its very core an entertaining film and I firmly disagree that it is an "uninspired" film with no redeeming characteristics. I recall seeing the water scene as a child and having my mind blown. That sequence is nothing short of incredible and do this day I do not know why they never attempted something that scale before. It exemplified why I enjoy these films as the humans have the proverbial deck stacked against them. With this scene alone, Resurrection warrants not only a screening but discussion. I firmly disagree with the critics (Ebert especially) that this film is simply trash that should be thrown on the rubbish heap. Certainly, it is not a perfect film by any stretch of the imagination but it does expand the Aliens "universe." 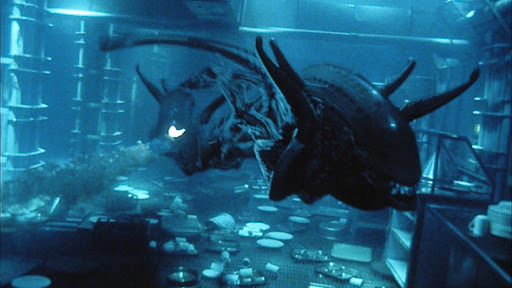 Of course, this is not the way that one wanted to end the adventures of one Ellen Ripley. Movie Night: WTF is Mumblecore? Where's Waldo ain't got sh*t on me!